The new issue of the critically acclaimed sci-fi epic will feature a special 3-D diorama cover. 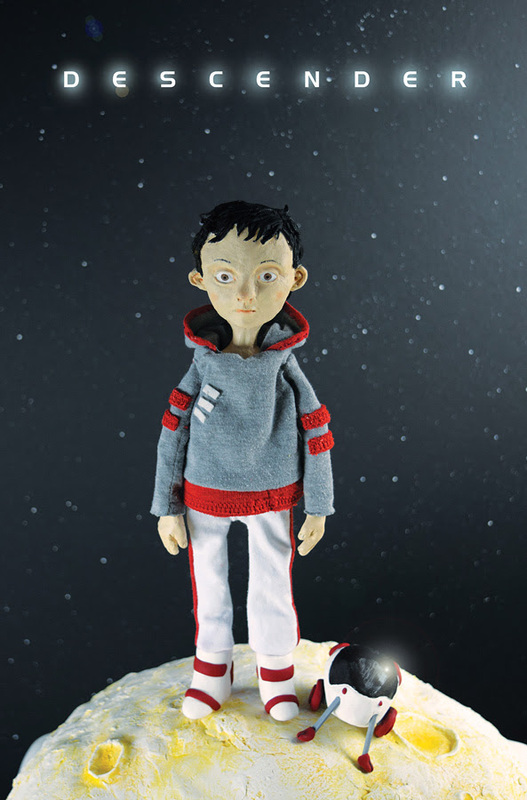 New York Times bestselling writer Jeff Lemire (SWEET TOOTH, TRILLIUM, PLUTONA) and New York Times bestselling artist Dustin Nguyen (MANIFEST ETERNITY, BATGIRL) will launch the second story arc of the critically acclaimed series DESCENDER in November. Previously in DESCENDER, readers met the young robot boy TIM-21 and his companions as they struggled in a universe where androids are outlawed and the skies are all but safe from bounty hunters and other thugs. In DESCENDER #7, a mysterious figure from TIM-21’s past emerges and sends shockwaves through the galaxy. DESCENDER #7 cover A by Dustin Nguyen hits stores Wednesday, November 4th. Cover B by Lesley-Anne Green will feature a 3-D photo cover, and will also be available on Wednesday, November 4th.